At Christie's last week, I met Elana Rubinfeld, a charming young woman who is the director at Fred Torres Collaborations, a new art gallery in Chelsea. She invited me to see an exhibition at the gallery of work by artist Alessandro Twombly. I hoofed it up to West 29th Street between 10th and 11th Avenues, a block I had not been down before. The gallery is on the third floor, and sunlight glowed through windows covered with white shades. The art work, in shades of pink, floated on white walls creating a festive party atmosphere. Alessandro Twombly is the only child of Cy Twombly, who at 81 is one of the greatest artists living today. Cy Twombly inherited his name from his father who was named after Cy Young, the renowned pitcher. 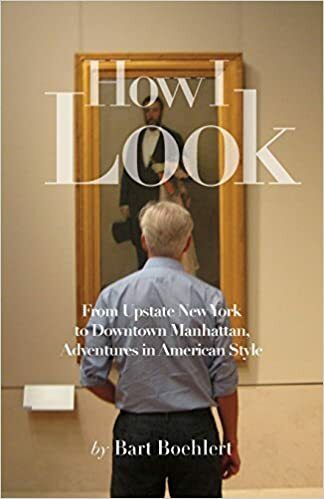 The American artist settled in a Roman palazzo with his wife Tatiana Franchetti (the sister of modern art patron and collector Barone Giorgio Franchetti) and their son Alessandro, and went on to create his famously poetic, cryptic, abstract paintings and drawings. Son Alessandro has always worked as an artist too. He is married to couture fashion designer Soledad Twombly and they have two children. The family lives in Rome and in a house outside of Rome, where his mother Tatiana lives as well. Alessandro's work is not as abstract as his father's -- he is often inspired by flowers. The work is spirited, lively, rich. The joyful colors and organic shapes have a happy exuberance. Cy Twombly's life in Rome has interested me since I came across in the F.I.T. library a Vogue story from 1966 about the Twombly Roman palazzo, photographed by Horst and written by his partner Valentine Lawford. In the story the interiors of the elegant palazzo are pale grey and white -- the perfect combination of classical furnishings and Cy Twombly's abstract art. 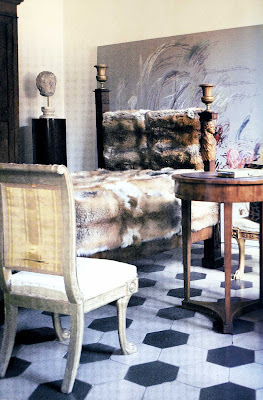 A bedroom, below, featured Mongolian fox, Empire furniture and art by Cy Twombly. Today when you see Julian Schnabel's style of decorating, I think this is where it comes from: Twombly's mix of Baroque, grand furniture with oversized abstract art. 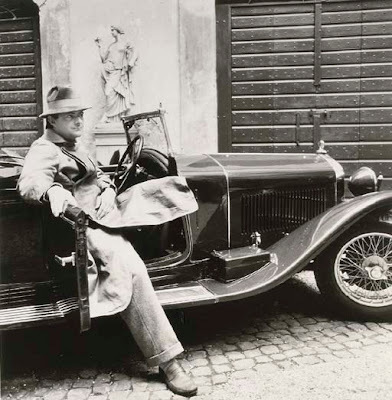 Here is Cy Twombly from that shoot at the palazzo in his 1928 Alfa Romeo wearing a World War I leather greatcoat. Like father, like son: coincidentally Alessandro Twombly's house outside of Rome is published in the current issue of Elle Decor. Photographs of the interiors feature the sculpture and paintings now on view in Chelsea: life as art/art as life. Today when you see Julian Schnabel's style of decorating, I think this is where it comes from: Twombly's mix of Baroque, grand furniture with oversized abstract art. it does! i'm happy you said it. i truly enjoyed this post. I was just writing about the same thing, which is how I came across your blog. Nicely written! I wish I had seen the show. 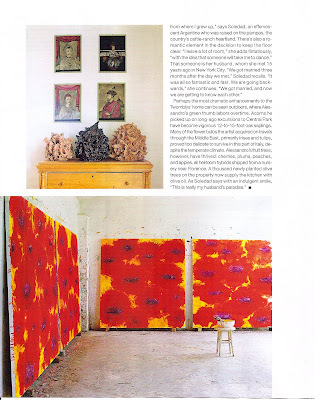 What do you think of the similarity between the large red and yellow canvasses at Fred Torres and Cy Twombly's show at Gagosian in 2007? nice post, bart. i remember seeing those pictures in vogue and being astounded by the style and perfection. Nice blog, but a correction, if I may. Cy Twombly is not the son of Cy Young. Cy Twombly's father was nicknamed 'Cy' after the great pitcher Cy Young. Young never played for the White Sox. Thanks for clarifying Doug, I have made a correction.